New to diluting your essential oils with carrier oils? Essential oils are 100% natural and have so many wonderful benefits, but it’s important that you handle them with care. These potent oils are highly concentrated, which is why they often come in such small bottles – a little bit goes a long way! Always take time to properly dilute your essential oils with carrier oils before use, especially when applying directly onto your skin. Failure to dilute could cause serious health effects such as skin irritation, burns, photosensitivity, and even illness. But don’t let this scare you away from using essential oils – dilution is really simple and it actually prolongs the life of your oils! So what is a carrier oil exactly? The term carrier oil comes from its initial purpose, which is carrying the essential oil onto the skin. Diluting oil with carrier oils also helps control the consistency and potency of essential oils without losing any of their therapeutic effects. An indispensable companion of essential oils, carrier oils are natural, neutral-smelling, and typically have amazing health benefits of their own. What kind of carrier oils do we carry? What can’t you use coconut oil for? Coconut oil can be used daily as a hair oil by applying 1-2 drops onto your finger tips, rubbing both hands together to heat up the oil and running it through the ends only, or use weekly as a mask using about 2-3 tsp and spreading it from your scalp to ends (run through with a brush) – let it sit for 30min to 1 hour, to hydrate dry, brittle hair. Since there is high fat content in coconut oil it also is very hydrating for your skin, which helps prevent wrinkles, and even leads to clearer skin. Almond Oil is a quick absorbing oil and a great source of vitamin E and oleic acid- which makes it another great choice to use as a moisturizer. One thing that sets almond oil apart from a lot of the other carrier oils is that not only does it moisturize dry hair, it is used to help treat hair loss. Apply 1 tbsp of warm almond oil and massage into scalp every night after cleansing. How to use as extensive treatment: Rinse your hair and comb excess water out. Once thoroughly combed, apply warm almond oil to scalp and brush through to the ends. Wrap hair into shower cap. Let it sit for one hour, or overnight if needed. The make up of jojoba oil is very similar to sebum, which is a something our skin glands naturally produce to lubricate the face and scalp, jojoba oil mimics the effects and acts as a natural moisturizer as well. It is extremely safe to use, it is non-comedogenic and non-allergenic so it will not clog pores, and can be used safely around the eyes. You can use the oil as a natural and moisturizing make-up remover as well- apply a couple drops onto a cotton ball, swipe across face and neck. Use until face is clean, and don’t worry about the amount used-jojoba oil will not dry your skin. How can you use jojoba oil for hair? Well a couple drops and you can smooth frizzy hair. Men- you can also substitute your beard oil with jojoba oil for awesome results. When using on skin: 1-2 drops of oil on skin. Argan oil is non-greasy and acts as a natural moisturizer that is high in vitamin E and fatty acid contents which is essential for anti-aging purposes. Argan Oil can also help protect hair and skin from UV damage due to its high level of antioxidants- it helps recover sunburns more quickly but also works to protect the skin’s DNA to prevent skin cancer. When using on hair: to promote hair growth and repair damaged hair use 2-3 drops (depending on length of hair) massage into scalp and run through ends. 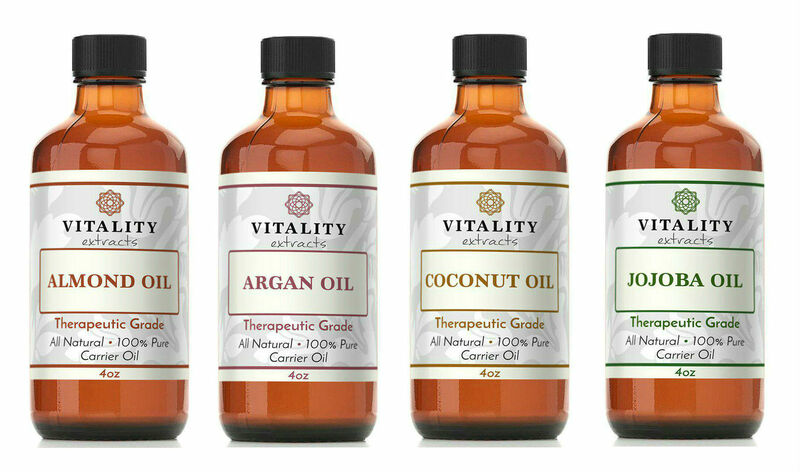 How do you dilute your essential oils with our carrier oils? The dilution ratio depends on the oil and who is using it. Some oils like lavender and ylang ylang are mild, requiring less dilution, while potent oils such as tea tree will need to be diluted more heavily. Use your best judgement and dilute more if you feel a burning sensation or irritation- so be sure to test a small amount at first. Always dilute .25% when using essential oils on children under the age of 7. We recommend this ratio for children over the age of 7, pregnant women, and elderly adults. This ratio works well for most adults. Use this ratio to treat temporary medical conditions, sore muscles, and congestion. Some mild essential oils can be used at this strength for healthy adults, but be cautious.